Each year, many young people achieve the milestone of college graduation. The joyous occasion full of cheers and tears signals to most students that they are collecting their ticket to the world of “true adulthood”. For some, a dream job is around the corner. For others, the pursuit of a graduate degree is the next stop along the path. No matter the direction, data from American Student Assistance shows that more than 70 percent of recent graduates received a bill with the rite of passage of graduation. While student debt is often viewed as a required burden for most college students, there are great stories to show you can avoid the lifetime bill, if you have a plan. Endiah Green, a Spring 2018 Biology graduate of Grambling State accomplished the seemingly impossible – graduating with her Bachelor’s degree debt free. “Maintaining a high GPA is critical. This makes you eligible for a larger population of scholarships and internships,” said Green. Looking back, Green knows that as she sat in a crowded assembly center surrounded by her peers, behind the majority of those black robes sat people in mountains of student loan debt. “My advice for those graduates looking to pay off loan debt would be to create a budget around your student loans in order to prioritize paying them off,“ advised Green. 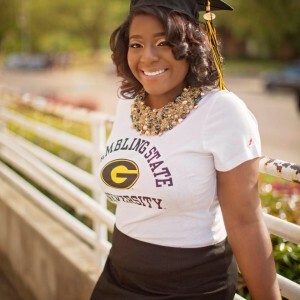 “My biggest struggle was finding and getting scholarships that would help me pay for school while constantly working. Sometimes opportunities were presented to me. Other times, I really had to do the groundwork and search for them on my own,” said Green. So, whether you’re a Freshman just starting out your college career or nearing graduation, take note of this great advice if to graduate debt free (or at least with a little less). For more information on scholarships and other financial assistance, visit GSU’s Office of Financial at www.gram.edu/finaid. This entry was posted in Uncategorized on July 3, 2018 by Jovan Hackley.